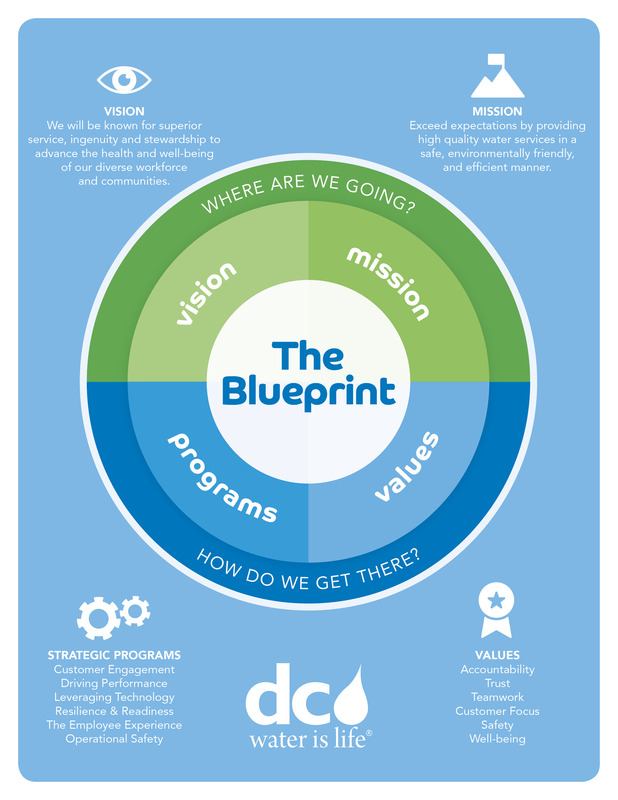 The Blueprint guides DC Water in setting priorities, focusing energy and resources, and strengthening operations. The strategic plan ensures employees and stakeholders are working towards common goals and aiming to accomplish our vision. We will be known for superior service, ingenuity and stewardship to advance the health and well-being of our diverse workforce and communities. Exceed expectations by providing high quality water services in a safe, environmentally friendly, and efficient manner. Accountability: We conduct ourselves in a manner that surpasses ordinary standards and take responsibility for our actions and their collective outcomes to our workplace, community and environment at all times. Trust: We strive to achieve the highest standards of professionalism and ethical behavior by always seeking to be open, honest, fair and respectful. Teamwork: We approach all we do in a collaborative way, delivering superior service and outcomes through enthusiasm, helpfulness, positivity, skills, knowledge and a collective commitment to excellence. Customer Focus: We see every engagement with our customers as an opportunity to deliver an exceptional customer experience that improves customer satisfaction and the overall perception of DC Water among the communities we serve. Well-being: We recognize DC Water’s number one resource is our people. We are committed to seeing that our team thrives physically, mentally and emotionally by endeavoring to create a culture that increases awareness, inspires individual responsibility, promotes healthy choices and encourages work/life balance.